Baby bok choy is one of my favorite asain vegetables and add it to all my stir fries or is perfect as a side dish as is! Serves 4. Cut lower section off of bok choy, like you would with romaine lettuce. Rinse and drain. In a medium sized skillet heat toasted sesame oil over medium high heat. 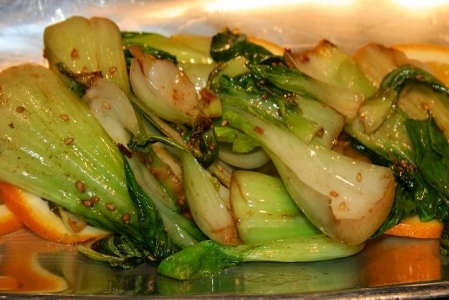 Add bok choy and sauté until the color of the bok choy changes. Add soy sauce and garlic sesame seeds and sauté for another minute. Serve family style.